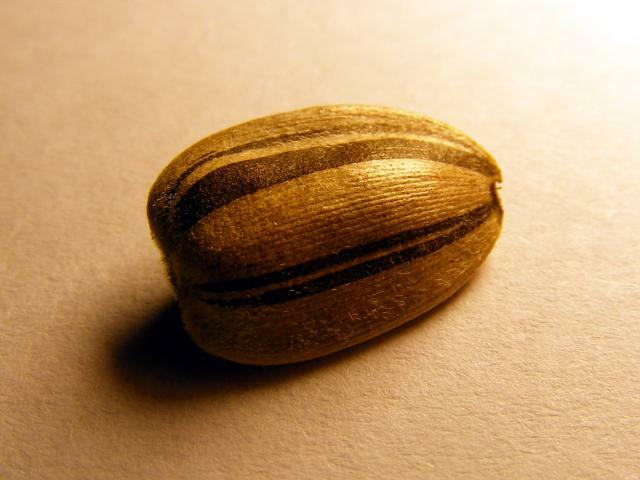 Oil type seeds contain 40% oil and represent 80-95% of sunflower seed production. 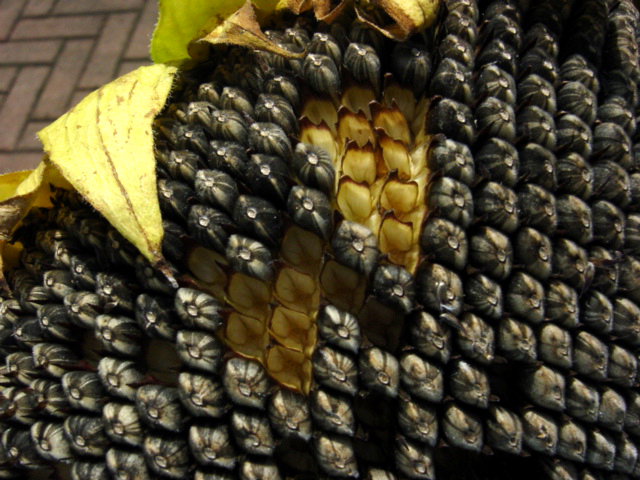 The hulls (20% of the seed) are black and tend to adhere to the kernels (USDA, 2010). Oil types are grown for their oil, resulting in an oil cake (sunflower meal) which is a popular protein-rich ingredient of livestock feeds (van der Vossen et al., 2007). Discarded seeds from the oil extraction process may be fed whole to livestock (OECD, 2007). Non-oil types, or confectionery types, contain 30% oil and represent 5-20% of sunflower seed production. 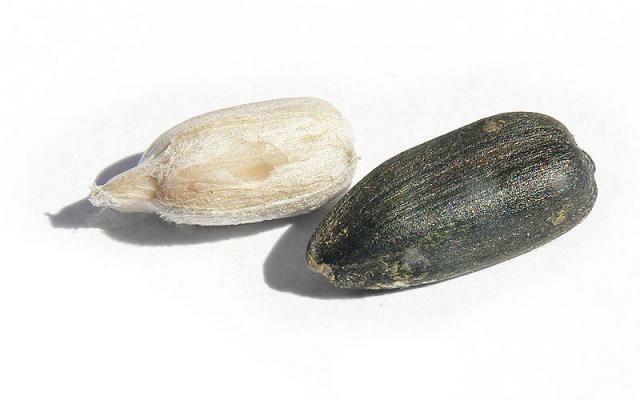 The hulls (40% of the seed) are of variable colour (black, white, or striped grey/black and white) and are easily removable (USDA, 2010; OECD, 2007; Grompone, 2005). Most of the non-oil seeds are destined for the confectionary market. The smallest seeds are used as birdseed and pet food (van der Vossen et al., 2007). Though sunflower seeds are mainly used for oil extraction, they are also edible and can be used as snacks and as an ingredient for bakery specialties. They may be sprouted and put into salads. Apart from their uses in the food industry, non-oil type sunflower seeds are common ingredients in pet bird food. Oil-type sunflower seeds have a valuable oil content and fatty acid composition for livestock, notably beef and dairy cattle. Sunflower seeds have an interesting fatty acid profile that may help improve meat in beef and milk fatty acid content in dairy cows (OECD, 2007; Gagliostro, 2004). Sunflower is the 5th oilseed crop in the world and accounts for 8% of oilseed world production (FAO, 2011) with 32.3 million t produced in the 2010/2011 harvest (Oil World, 2011). Native to Central North America, sunflower is now found all over the world, from Russia to South America. Russia is the world’s first sunflower producer (Ecoport, 2011). Together, Russia, Ukraine and Argentina produce more than 50% of the world’s sunflower seeds (FAO, 2011). Various processes have been assessed to improve the nutritional value of sunflower seeds. Dehulling increases the protein content and decreases the fibre content. However, while sunflower seeds are often subject to dehulling, either to make confectionery products or before oil extraction in the case of oil seed types, the process is costly and dehulled seeds are seldom used as animal feed (OECD, 2007). Recent sunflower varieties have less hulls and are more difficult to decorticate. Numerous treatments have been use to increase the shelf life of sunflower hulls (roasting and extrusion) (Bühler Group, 2012). Heat and formaldehyde treatments have been used to improve their nutritional value. Sunflower seeds are valued for their oil content, which accounts for about 50% of the seed dry weight. Regular sunflower oil is characterized by a high concentration of linoleic acid (62-75%), followed by oleic acid (16-27%). Saturated fatty acids do not amount to more than 15% of the fatty acid content. The oil of high-oleic sunflower varieties contains more than 80% oleic acid. Mid-oleic varieties (65%) have also been developed (Grompone, 2005). The rest of the dry matter consists of protein (14-20%) and fibre (NDF 18-34%, ADF 15-25%, lignin 5-8%). Sunflower protein is less rich in lysine (about 4% protein) than soybean protein but has relatively high amounts of sulfur-containing amino acids (1.9 and 2.2% protein for cystine and methionine respectively). Sunflower seeds do not contain antinutritional factors such as those found in other major oilseeds, including soybeans, cottonseeds and rapeseeds. For that reason, it is considered to be a safe feed for all livestock species. However, residues and contaminations from sunflower cultivation, harvest and post-harvest operations may be of concern. Sunflower seeds are prone to insect and mite infestations and proper storage methods should be used to prevent insect development. The use of pesticides may result in residues in the seeds. In the European Union, the maximum acceptable level of pesticide residues in sunflower seeds is set in the Commission Regulation (EC) No 839/2008 (European Union, 2008). Sunflower seeds should be monitored for mycotoxin contamination, including aflatoxin B1 and ochratoxin (Finoli et al., 2004). Sunflower seeds are a safe, palatable and nutritive ingredient for ruminants. They are used as an energy source but they are particularly valued as a supplement for ensuring the correct fatty acids profile of meat and dairy products. This is because sunflower oil is rich in polyunsaturated fatty acids and conjugated linoleic acid, which have proven beneficial effects on human health (anticarcinogenic activity, anti-hypercholesterolemia and anti-fat deposition) (Peng et al., 2010; Basarab et al., 2007). Feeding sunflower seeds resulted in higher conjugated linoleic acid and C18:2 omega-6 content in milk and meat of cows, ewes, goats, steers and sheep (Yin FuQuan et al., 2009; Wyss et al., 2006; Ortiz et al., 1998b; Addis et al., 2009; Zhang et al., 2006). Sunflower seeds might also have beneficial effects on reproductive parameters in both females and males (Girginov et al., 2008; Adeel et al., 2009). Sunflower seeds might also result in increasing lag time of degradation in the rumen and in a reduction of methane emissions (Beauchemin et al., 2009; He et al., 2005). Sunflower seeds improve rumen bacterial activity: they reduce the rumen protozoa (rumen bacteria predators) and thus increase total bacteria and subsequent bacterial amino acid flow (Ivan et al., 2004). The energy value of sunflower seeds has not been widely studied. INRA-AFZ and NRC give ME values of 17.9 and 19.7 MJ/kg respectively (Sauvant et al., 2004; NRC, 2001). A much higher value of 21.50 MJ/kg DM was estimated in a trial with steers (Gibb et al., 2004). Sunflower seeds can be fed raw (unprocessed). Cracking or rolling sunflower seeds prior to feeding had no advantage, as the large seed size results in cows chewing and breaking them down during rumination. Sunflower seeds should be mixed with other feeds to prevent over-selection due to their high palatability (NSA, 2012). Feeding lactating cows with sunflower seeds provides energy and valuable fatty acids for milk quality enhancement. Sunflower seeds have been shown to increase milk quality by increasing unsaturated fatty acids in the milk and, particularly, polyunsaturated fatty acids (Yin FuQuan et al., 2009; Wyss et al., 2006; Ortiz et al., 1998b). Sunflower seeds had a positive effect on conjugated linoleic acid and omega-6 fatty acid milk content (He et al., 2005; Liu et al., 2008). In addition to their desirable effects on health, these fatty acids have positive effects on technological characteristics of milk and butter (butter spreadability, storage) as well as butter flavour (Kudrna et al., 2008; Silva Hernandez et al., 2007; Middaugh et al., 1988). However, because sunflower seeds are high in fat, large amounts of sunflower seeds in the diet may cause scouring and depress feed consumption, milk yield, and milk fat and protein content (Wyss et al., 2006; Schori et al., 2006; Mansoori et al., 2011b; Sarrazin et al., 2004). Recommended inclusion levels are thus moderate: 7.5-8% sunflower seeds in dairy diets resulted in satisfactory fatty acids profiles without depressing milk production (Mansoori et al., 2011b; Sarrazin et al., 2004). Prepartum energy supplementation, regardless of energy source, may improve reproductive performance. Sunflower seeds included at 6.7% in the diet had positive effects on primiparous dairy cows as it decreased the interval from calving to first ovulation (Mendoza et al., 2008). Multiparous dairy cows fed sunflower seeds had a higher rate of first conception (Girginov et al., 2008; Banta et al., 2007). However, other reproductive performance such as feedlot performance and carcass characterisitics were not affected by the inclusion of sunflower seeds (Banta et al., 2007). In dairy cows, roasting reduced DM intake, milk fat content and milk fat yield but did not affect milk production (Sarrazin et al., 2004). 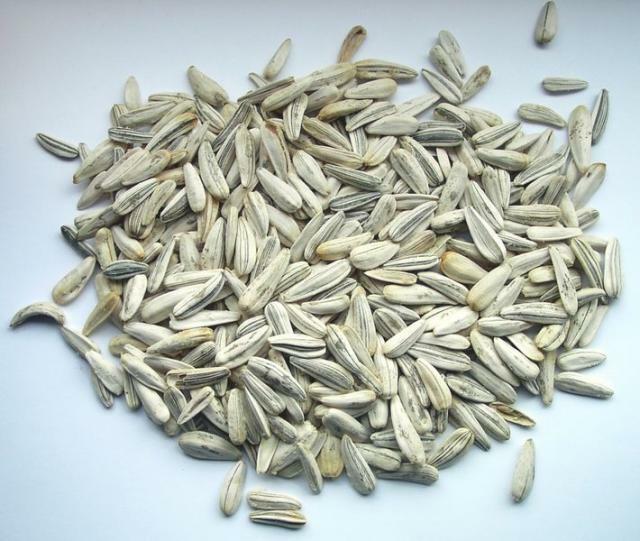 Heat-treated sunflower seeds could be included at up to 7.5% in the diet (Mansoori et al., 2011a). Formaldehyde treatment was beneficial to milk fat yield and milk production because of greater digestibility of dry matter and fatty acids but did not have a protective effect on polyunsaturated acids (Petit, 2003). Heat treatment had a negative effect on milk protein when sunflower seeds were incuded at 15% of the diet (Mansoori et al., 2010). Whole sunflower seeds could be included at 15% of the diet for finishing steers replacing the same percentage of rolled barley. Sunflower seeds improved feed efficiency and decreased DM intake, but not the yield of lean meat. They decreased carcass global fat content while increasing muscle fat (Mir et al., 2008). Feeding sunflower seeds also had a positive effect on meat quality by increasing the levels of conjugated linoleic acid in both fat and muscle (Basarab et al., 2007). In heifers, whole sunflower seed seemed to improve growth efficiency (NSA, 2012). Sunflower seeds introduced in a barley-based diet prevented liver abscesses but caused energy loss in the feces because of decreasing stearate digestibility (Mir et al., 2008). Feeding lambs and meat sheep on sunflower seeds is a good way to improve nutritional quality of the meat without impairing dressing percentage or carcass characteristics (Almeida et al., 2011; Peng et al., 2010). In lambs, it increased the proportion of unsaturated fatty acids at the expense of saturated fatty acids (Macedo et al., 2008a; Peng et al., 2010). In meat ewes, sunflower seeds increased the levels of polyunsaturated fatty acids and conjugated linoleic acids (Peng et al., 2010). The inclusion of sunflower seeds at 20% of the diet did not change qualitative and morphometric characteristics of lamb carcasses (Macedo et al., 2008b). Including sunflower seeds in lamb diets may help reducing protein supplementation: sunflower seeds added to a low protein diet yielded the same average daily gain as a high protein ration. They also increased the digestibility of high concentrate rations. Their effect on feed intake resulted in an improved feed conversion ratio (Ivan et al., 2004). Sunflower seeds can be introduced in ewes diets at 6-10% (Peng et al., 2010; Zhang et al., 2007). Ewes supplemented on sunflower seeds had similar DM intakes and nutrient utilization as ewes fed the control diet (Zhang et al., 2007). Digestibility of DM and fatty acids was higher, particularly for oleic acid (C18:1), resulting in higher levels of long chain fatty acids in both milk and meat (Addis et al., 2009; Zhang et al., 2007; Peng et al., 2010). Supplementation with sunflower seeds had no effect on milk yield and decreased milk total solids, milk protein and milk fat contents (Zhang et al., 2006). However, the levels of unsaturated fatty acids (C18:3) and conjugated linoleic acids were greater in milk and cheese (+ 63% and + 140%, respectively) for ewes fed sunflower seeds than for ewes fed control (Addis et al., 2009; Zhang et al., 2006). The cheese composition in C18:1t11 and C18:2c9t11 fatty acids was similar for ewes fed sunflower meal and for grazing animals during the period of high quality pasture (Addis et al., 2009). Sunflower seeds can be included at 6-10% in goat diets in order to alleviate weight loss during periods of feed scarcity (Warambwa et al., 1992). Sunflower seeds resulted in slightly lower milk yields but had a limited impact on milk fat and milk protein content. Feeding sunflower seeds to goats improved the content of long chain fatty acids in milk at the expense of short chain fatty acids, thus improving cheese quality (Zucali et al., 2007). Sunflower seeds have a high oil content and can be a valuable energy feed for pigs, but their fibre content limits their use in growing animals. Recommended inclusion rates for sunflower seeds range from 8% to 10% in diets for growing and finishing pigs, and up to 25% for sows (Zara et al., 2005; Royer et al., 2005; da Costa et al., 2003; Albar et al., 2000; Dinusson et al., 1989). Including sunflower seeds in pig diets was reported to slightly increase protein digestibility (Noland et al., 1980; Marchello et al., 1984). Nevertheless, sunflower seeds had deleterious effects on DM intake, daily weight gain and feed efficiency, which linearly decreased with increasing inclusion levels at all stages (weaning, growing, finishing) (da Silva et al., 2003; Laudert et al., 1975). In sows, inclusion of sunflower seeds had beneficial effects on milk fat content but had no effect on weanling weight or on survival (Kepler et al., 1982). The effect of sunflower seeds on meat quality parameters such as tenderness, juiciness and overall acceptability used to be thought as negligible, but later trials found that feeding sunflower seeds could result in high levels of linoleic acid in backfat (21%), much above the accepted limit of 15%. It was then recommended to limit the inclusion of linoleic acid at 1.5% of the diet (Wahlstrom, 1985; Courboulay et al., 1994). High-oleic sunflower seeds can increase the production of desirable polyunsaturated fatty acids in pig meat. Such seeds can be included at 8% of the diet without compromising meat quality, while older varieties had deleterious effects at the 4% inclusion level (Albar et al., 2000). 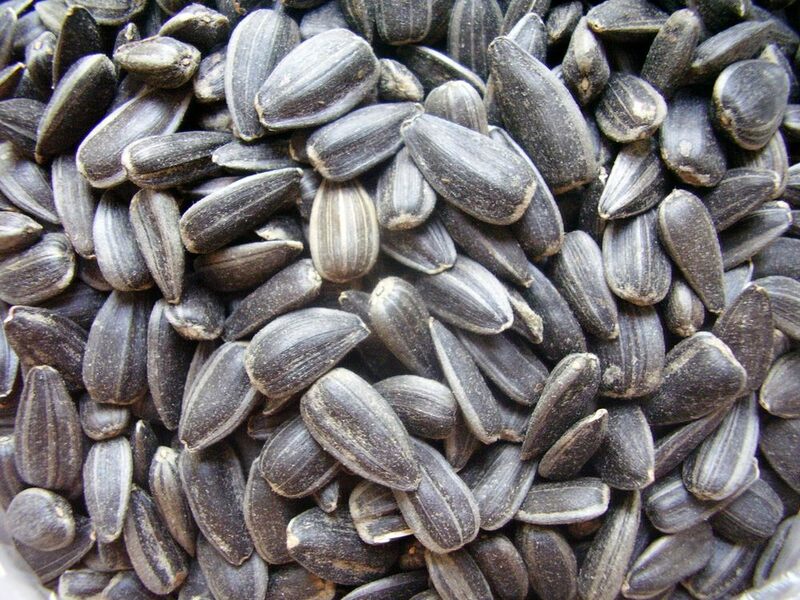 Sunflower seeds are valuable high energy feed for poultry. They can be fed raw or dehulled and can be included in poultry diets at up to 50% (Dolis et al., 2009; Rodriguez et al., 2005; Olugbemi et al., 2002), though literature commonly recommends 25-30% inclusion (Dolis et al., 2009; Rodriguez et al., 2005; Olugbemi et al., 2002; Arslan et al., 2000; Ortiz et al., 1998a; El Zubeir et al., 1991). Unlike soybean seeds, sunflower seeds do not require prior heat treatments and are a cheaper energy source than other oilseeds (Malakian, 2010). However, dehulling is recommended as it decreases fibre content and increases their nutritive value, resulting in higher performance in broilers (Dolis et al., 2010; Dolis et al., 2009). Whole and dehulled sunflower seeds could be fed to starter chicks between 0 and 4 weeks-old at up to 20% of the diet. Higher levels resulted in lower crude fibre digestibility (Malakian, 2010; Olugbemi et al., 2002). In finisher broilers, inclusion of sunflower seeds can be as high as 40% without altering weight gain, feed intake or feed conversion efficiency (Olugbemi et al., 2002). Sunflower seeds were found to increase feed efficiency due to a lower feed intake and better or similar weight gain, which may result in lower feed costs (Dolis et al., 2010; Torki et al., 2007; Cheva Isarakul et al., 1991). Sunflower seeds also alter meat quality as they increase abdominal fat and reduce skin percentage (Malakian, 2010). The substitution of high-oileic sunflower seeds for maize grain, soybean meal and sunflower oil up to 20% of the diet did not have any adverse effect on the performance of young (12 d) or older (42 d) birds, though the digestibility of fat and major fatty acids was negatively affected (Rodriguez et al., 2005). Sunflower seeds can be fed to laying hens to replace cereal grain. They did not cause a fishy flavour in eggs, as it has been sometimes reported with flaxseeds (Blair, 2007). Inclusion of up to 5.6% sunflower seeds in laying hens diets had no effect on daily feed intake, average egg weight, feed conversion efficiency, eggshell percentage, yolk colour or Haugh unit score (Tsuzuki et al., 2003). Quails can also be fed up to 30% whole sunflower seeds in their diet with no adverse effects on performance (Arslan et al., 2000). Unlike sunflower meal, which is a major ingredient in rabbit feeds, whole sunflower seeds have been little studied in respect to their potential for feeding rabbits. In one report, the average daily gain of growing rabbits fed up to 30% sunflower seeds was higher than for the control diet (0%) but the high mortality (50%) of rabbits fed the test feed makes this result questionable (Balogun et al., 1991). The only useful conclusion is that sunflower seeds can be used in growing rabbit diets up to 30% (Lebas personal communication, 2012). In breeding rabbit does, 20% sunflower seeds were included in the diet to study the effect of increasing dietary energy by increasing lipid content (from 2.5 to 8.5%). Results obtained with sunflower seeds were similar to those obtained with the combination of oil and sunflower meal, no specific effects being observed when whole seeds replaced that classic combination. Thus, inclusion of sunflower seeds up to 20% could be considered as safe for breeding rabbit does (Papp et al., 2000). van der Vossen, H. A. M. ; Fagbayide, J. A., 2007. Helianthus annuus L.. Record from Protabase. van der Vossen, H.A.M. & Mkamilo, G.S. (Editors). PROTA (Plant Resources of Tropical Africa / Ressources végétales de l’Afrique tropicale), Wageningen, Netherlands.